I would say without much hesitation # 4410 is the nicest starting point I have had for a restoration. Ed, the owner, did his homework. He found a very solid car and one not missing a lot of parts. 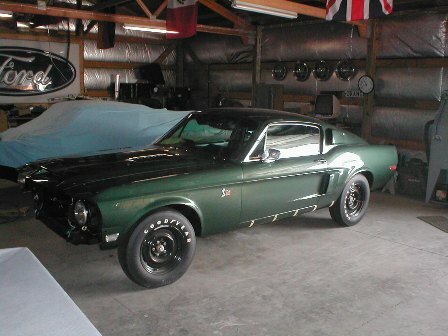 In addition to all that, the car was fairly well documented and retains its original drivetrain. 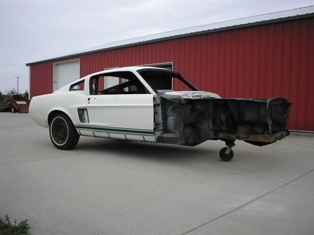 You are probably saying "that car doesn't need to be restored". The car was originally dark green. Ed wanted to get the details squared away and everything refreshed. The white paint was old and cracking in several places. Pictures do not always tell the true condition of a car. This is a good example. 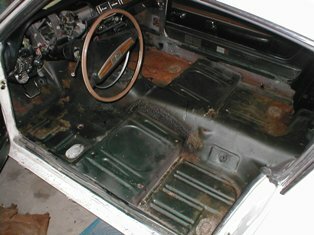 When I lifted back the carpet on the driver's side I noticed a build sheet. There was also a handful of unused nuts and bolts. 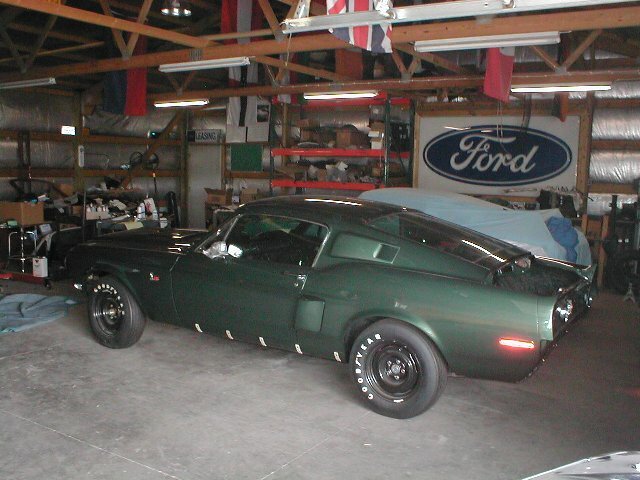 The build sheet was for another GT500 KR built on the same day as # 4410. 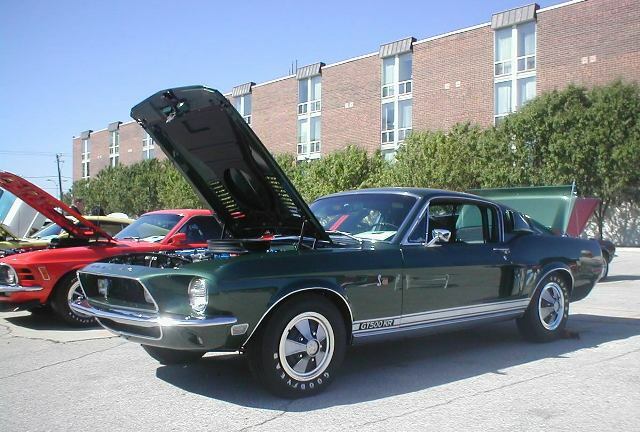 Both cars were GT500 KRs with 4spd transmissions, air conditioning and black interiors. Even more remarkable is the build sheet actually belongs to car # 3469. That car was one of three painted Royal Maroon. One of the other Royal Maroon cars (the only maroon convertible) was featured on the website last year. The floors on # 4410 retain the original Highland Green sprayed in New Jersey nearly forty years ago. You can see some rust has creeped in on the passenger side. The floor is very solid and it's mostly surface rust, but left unaddressed it will only get worse. 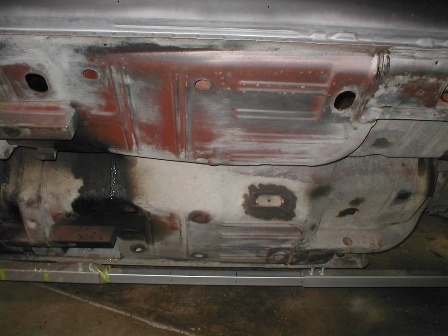 This is a common spot for rust on Mustangs, because heater cores can become plugged and leak. Here is the rear of the car with the back glass removed. You can see how much green paint the factory got inside. 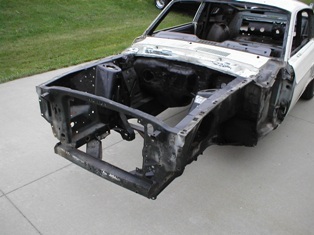 The front clip is solid with very little damage and ready for clean-up. 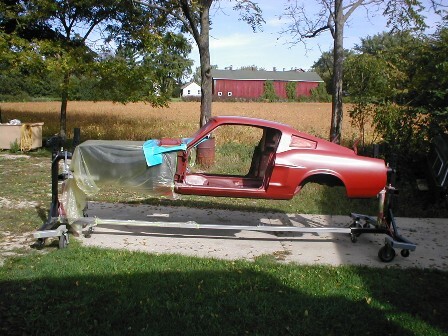 Everything is off the car and the parts are already being clean and refurbished. The bodyshop has been busy massaging the chassis. 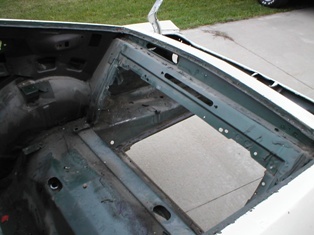 Three layers of old paint have been stripped off the car and I am getting ready to start reassembling the car. I have been squirreling away parts. Cleaning and painting are job one. You never know what you will find when you start digging around. 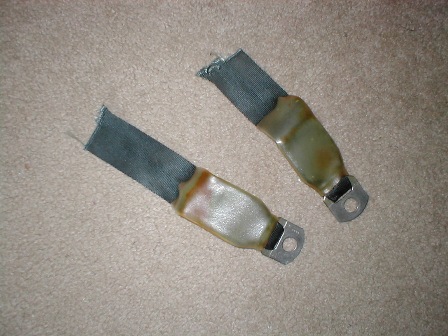 These rear seat belts had been cut off and stuffed under the rear seat. Rear seat belts have the protective boots on them. There was not much to do here. A good cleaning and little new primer. The frame rail extensions had to be straightened from improper jacking. 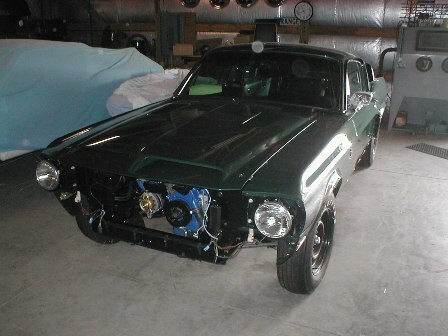 It is the nicest body I have seen on an unrestored car. That is original primer ! Did you notice the drips in the primer on the cleaned off area ? The gray areas are dirt and road grime. This is a before and after shot. 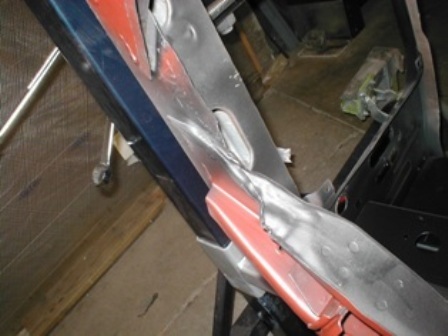 This damage was probably caused by a chain wrapped around the strut rod brace. I watched in amazement as the bodyman used a torch and a hammer to beat this back into shape. This is the roof. If your bodyman wouldn't give you a solid estimate, this is why. You never know what's under the paint. I found at two coats of thick white paint and two coats of primer over the factory paint. You can also see the round cirles. These are low spots and were most likely caused by hail. Each one had to be straightened. There was very little rust on this body. 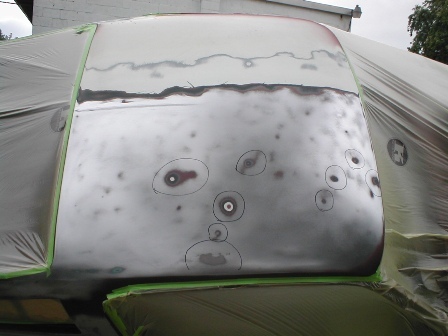 Rust also likes to hide under paint and body work. 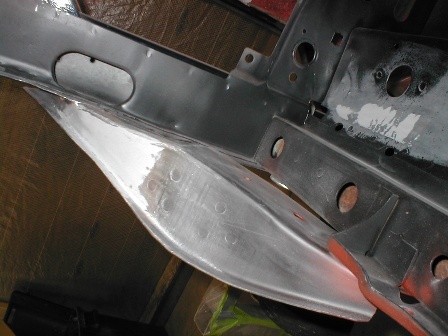 Once everything is straight and clean, it can get a nice coat of primer. That is followed by block sanding, more primer and color coats. 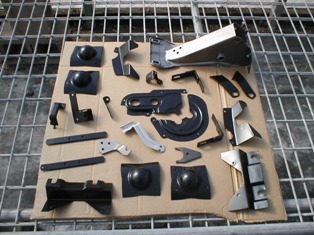 Here are some of the parts. It takes a lot of time to clean and paint everything needed for reassembly. Organization is important. Finding a good painter is hard enough. Finding one that can paint the drips properly is even harder ! After a lot of hard work, the topcoat has finally been sprayed! The dark green almost looks black in some light. The Highland Green already looks better than it did in 1968, but there will be some more massaging. 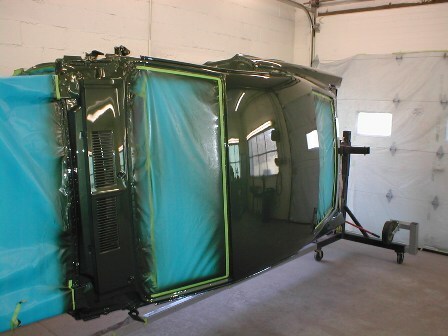 The doors, fenders and smaller parts were sprayed separately. The paint used was a base coat / clear coat sytem . I will have some information on the type of paints used in a future update. 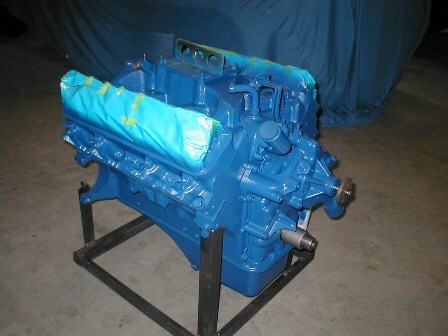 Here is the motor after it was painted. I use a spray gun. The corporate blue paint has some additional hardner for durability. You can see many of the brackets and fittings are painted in place. The smog tubes and pcv were also painted, but they are not installed in this photo. 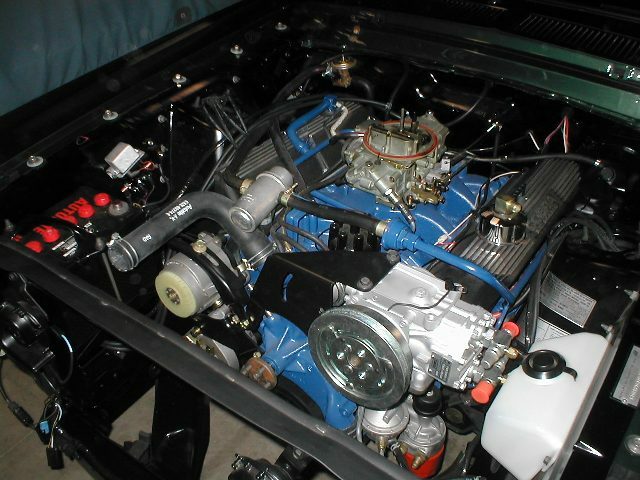 Some fittings were added after the engine was painted. This rear fitting is brass. More pieces will be installed once the engine is in the car. Since # 4410 is an air conditioned car, it received the oil cooler adapter. 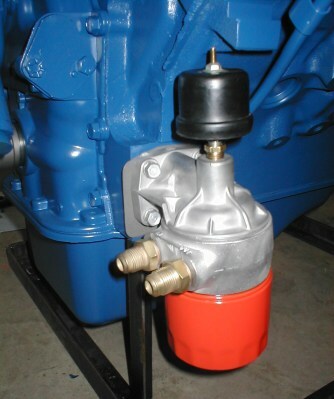 This adapter allows the attachment of oil lines to the remote oil cooler mounted under the bumper. 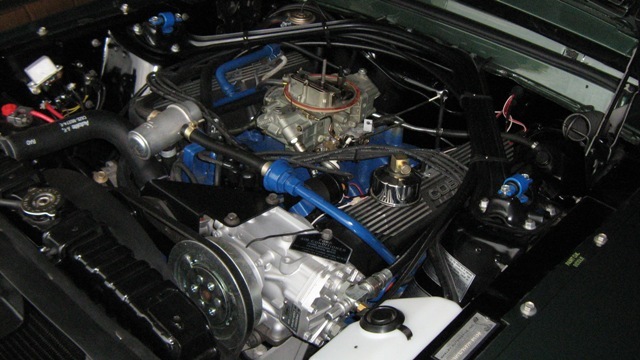 All big block 4 speed cars were issued the extra oil cooler. 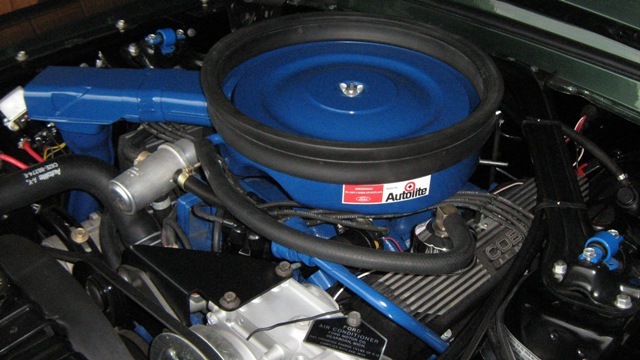 The oil filter used on these cars was much shorter than the standard filter to allow adequate ground clearance. 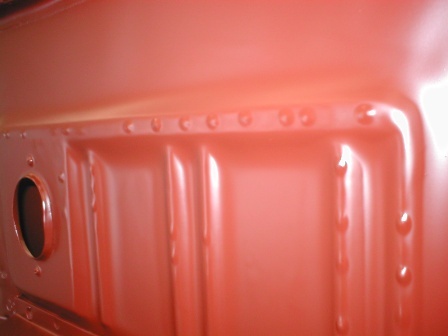 The filter was original bright orange as shown here. On the top of the oil filter adapter is the oil pressure sender. A small fitting joins it to the adapter. 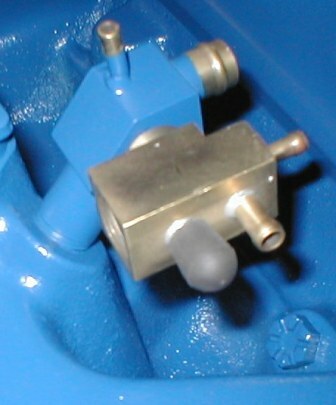 All 1968s used this style sender. 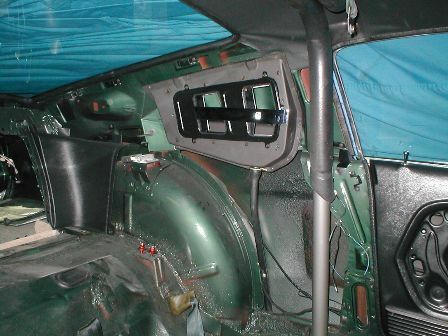 Working on the inside... the air vents have completely been rebuilt. 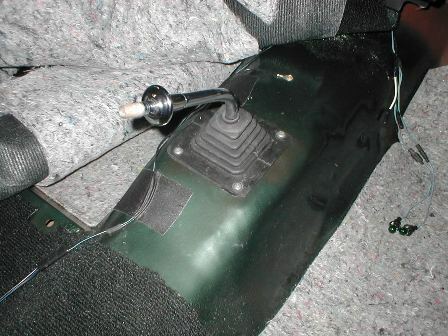 The drain hose for the exterior vent actually runs through the car and into the rocker. The large panel was replaced. 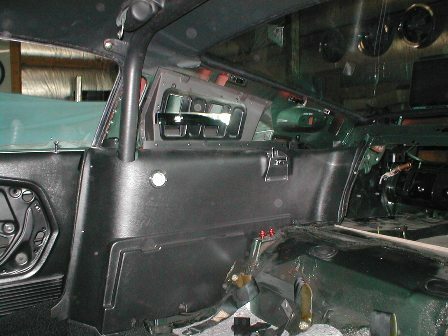 The original panel had large speaker holes. Finding nice originals was the best option. Reproduction panels do not have the same look. The shifter is in place. That means there is a transmission below. You can see here the boot is screwed to the floor. It will be covered by the carpet, followed by the console and the floating bezel. It's starting to look like a car missing a few parts. Like every project, this one is behind schedule. The trunk hinges had to be removed for some detailing. It's better to address these things now. Other things like life have a way of pushing projects back as well. Steady progress is all we can hope for. 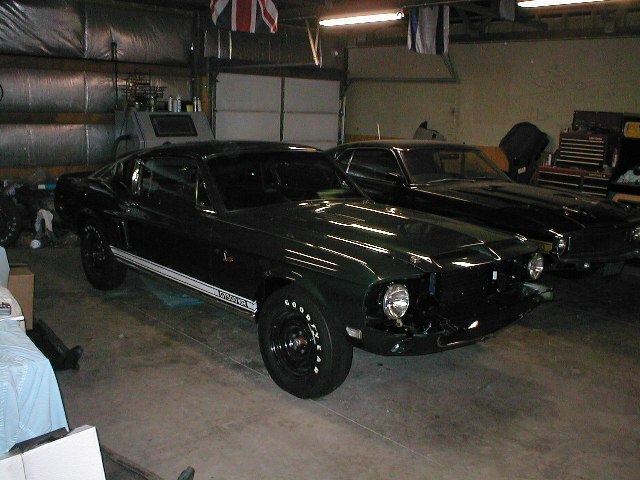 Those rocker panel stripes and moldings are coming soon. I usually like to stripe the car and then add the emblems, but I have done it so many times, I know where they go. You can see some front body work is needed. 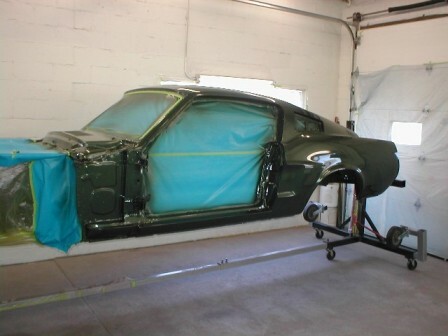 The fiberglass panels are best left off until the very end. 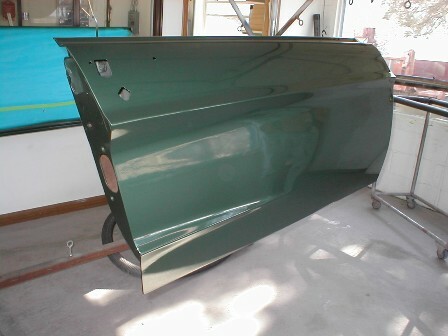 All of these panels were prefitted during the bodywork phase. 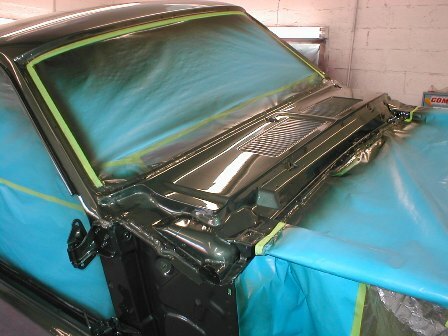 Fitting and adjusting everything is more time consuming, but you will have a better end product. I have developed an assembly order that works for me. It is constantly being massaged. The engine is starting to look really good. You can see there is not a lot of extra space when you have a big block with air conditioning. A little plumbing and we will be ready for a restart. Although work has slowed a bit, 4410 is almost complete. It is starting to look like a car missing a few parts. The new rocker panel stripes turned out really well. I still need to install the chrome wheel lip mouldings on this side. The engine bay was waiting for the original fan clutch. I am happy to report it has returned from the rebuilder and we be installed soon. It was holding back the fan, the shroud and the radiator assembly. This headlight was being stubborn. I straightened the bracket and did an excellent job. Unfortunately, the original bracket had a slightly angular design. I missed that and had to remove the headlight bucket and start over. 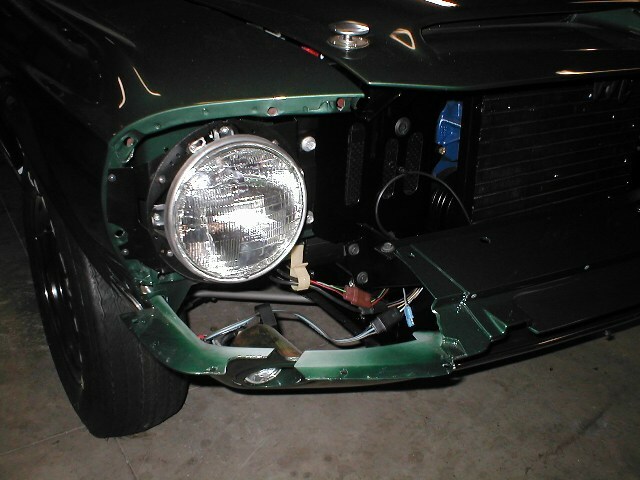 This is ready for the fiberglass headlight extension. The two wiring clips shown are now reproduced. The new wiring looks great and will last for another fifty years. Here is the engine without the air cleaner assembly. 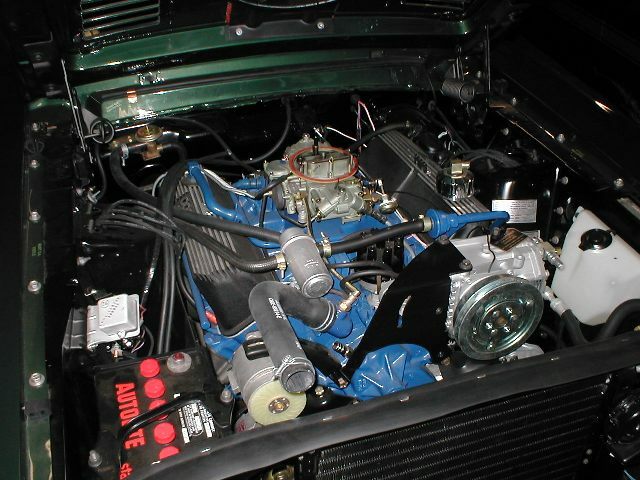 This engine is the original. I have not seen the judge's assessment of all the details yet, but I think it did very well. I drove the car a litte and it runs very strong. 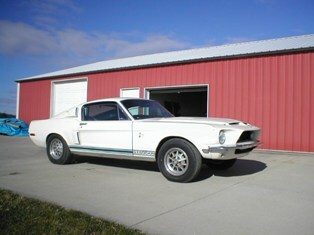 I hope to post some more pictures in the detailing section of the website. Here's one with the air cleaner assembly installed. I chose not to use the more common air cleaner decal. This decal was used on some cars. The Shelbys did not use the "RAM AIR" decal on the lids. 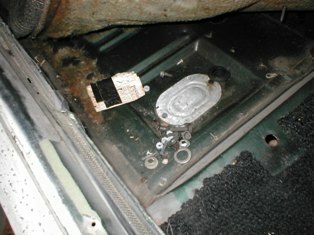 There's not a lot of room left in the engine bay with the air conditioning option. 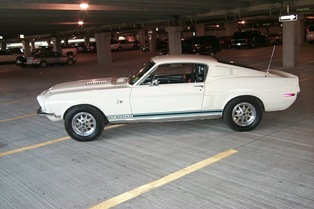 The finished product at the Mustang Club of America National Show in Des Moines, Iowa. The car was lucky enough to come away with a concours trailered Gold Award.